Thinking Pinoy: SOCEs and SALNs: Just how clueless, bookish, and lazy is PCIJ? SOCEs and SALNs: Just how clueless, bookish, and lazy is PCIJ? If there's one thing that can describe PCIJ's latest SOCE-themed article series, it would be "KABISOTE". I always try my best to make Politics funny and interesting for my readers, because politics and its periphery are an inherently very toxic subject matter and talking about it has taken a toll on me. So after a year of almost nonstop ThinkingPinoy, I decided to take a short vacation in Davao City. But just a few hours after landing in Durianland, I discovered that controversy after controversy erupted in Manila and I was like, "Heto na naman tayo! (Here we go again!)". Among these burning controversies are a series of articles released by the Philippine Center for Investigative Journalism (PCIJ), controversial mainly because  the articles tackle election spending and  PCIJ has a reputation for in-depth investigative reports. And yes, I checked the PCIJ articles one by one, hoping to find something interesting. And yes, I found a few interesting bits, but they’re interesting for all the wrong reasons. Let’s discuss the PCIJ articles one by one and to make this blog post easier to follow, let me first list down the articles-in-question. In THE WINDFALL OF ELECTIONS: 13 bets, 4 parties raise P69-M excess donations, PCIJ investigated what the candidates for national-level positions did with their excess campaign contributions based on their respective Statements of Campaign Expenditures (SOCEs). Losing senatorial candidate Isko Moreno reported an excess of P50 million (P171-m contributions minus P121-m expenses). Comparing his expenses with Franklin Drilon’s P144-m and Hontiveros’ P99-m, I have a reason to believe that he did not deliberately underspend. As to where the P50 million went is anybody’s guess, and I feel that PCIJ is correct when they decided to raise their eyebrows when they received this information. Thus, Moreno is either incredibly stupid, or incredibly honest, or both. What’s confusing for me, however, is their inclusion of other candidates in the same article, as all other candidates reported an excess of less than P5 million which, for a national-level campaign, wouldn’t really get any candidate anywhere. That is, their excess contributions fall under the third category, i.e. incredibly negligible. Minus Isko’s P50-million, there’s really nothing interesting here. It appears that PCIJ simply tried to stretch the article so it’d pass as a feature piece. I found it thoroughly disappointing, as I had higher expectations in an article from a purportedly distinguished institution. Si Isko Moreno lang ang problema tapos nandamay pa ng iba, para lang mapahaba ang article! According to PCIJ’s data set, Duterte reported P3.5 million in excess campaign donations. In theory, excess donations should be declared as income, so I guess that’s why PCIJ examined Duterte’s 2016 SALN, which shows an P500,000 increase, or P3 million short of the expected amount. However, a simple Google search with the keywords “Duterte Excess Donation” [Goog] leads to a May 2016 [Philstar] report indicating that Duterte returned the unused sums to the donors, which the newspaper said was “the first time excess funds were returned to contributors”. Surely, the supposedly prestigious organization could have pointed that out. But it didn’t. Alam na ng taong sinauli na ni Duterte ang pera... maliban sa mga taga-PCIJ. The article “PUZZLING PERSONAL SPENDERS: SALNs and SOCEs of some bets don’t add up” really puzzled me. Aside from Roxas and Marcos, whose out-of-pocket expenses are P18 million and P9.8 million respectively, the other presidential and vice-presidential expenses shelled out negligible amounts (less than P1 million) from their personal coffers, but PCIJ still decided to include other candidates in the chart. I don’t know if it’s just me, but what’s more puzzling is the fact that Leni was not on the table. Sure, Leni could have claimed that she spent none of her own money for the campaign, but would anyone buy that excuse? Seriously, not even a single peso? And do you still remember when she said, "Very creative nga 'yung aking mga volunteer. Kung anu-ano 'yung naiisipan. 'Yung fundraining dinner na for me, siguro mahigit lima at malaki talaga 'yung nakukuha sa mga fundraising dinners.“? Ain't that neat? Too neat? 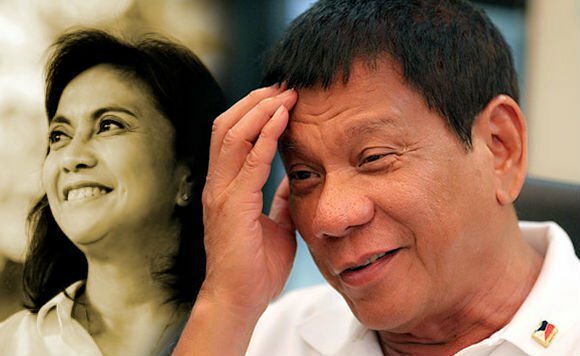 Would it have been wiser for PCIJ to explore Robredo’s case, considering that the P418 million she spent dwarfs winning presidential candidate Duterte’s 371 million, despite the fact that she is just running for VP? May pilit bang sinusunod na SOCE theme ang PCIJ kaya kahit mas mahalagang anggulo e dinedma na lang nila... Or was there a directive from “higher-ups” to avoid mentioning anything too negative about her? In CAMPAIGN FINANCE AND THE 2016 ELECTIONS: Donors, Inc.: Only 830 Filipinos bankrolled poll bid of 5 prez bets, PCIJ explained that a woefully small number of Filipinos funded the vast majority of presidential campaigns. I actually concede to that, and I myself am disturbed by this fact. PCIJ suggested that a candidate who relies too much on the contribution of too few is a “captured candidate”, which means he or she is more likely to be beholden to the interest of his or her small group of wealthy benefactors. Even I agree with that, especially in light of the public knowledge that Grace Poe enjoyed the blessings of Marcos crony Danding Cojuangco [TP: Coco Levy], a major figure in Poe’s social circle [TP: Connection]. PCIJ then went on to list the biggest contributors of each major presidential candidate, then it quickly analyzed the numbers without regard to the nuances of each of their campaigns. For such an organization, this is disappointing, to say the least. To say that there are only “830 Filipino Bankrollers” based solely on the SOCEs is lazy journalism. SALNs cover only the campaign period that started a few weeks after the dawn of 2016. However, actual big-ticket spending started way before that. Tingnan mo lang si Roxas, Binay, at Poe: hindi pa kampanyahan, nakaubos na ng pinagsamang P2 billion! Looking at this table, would it be reasonable to say that “only 830” bankrolled the candidates when a vast majority of the big spenders spent the vast majority of their funds before the campaign period even started, i.e. before the period that SOCEs cover? PCIJ is mostly technically correct when it said only 830 bankrolled the candidates during the campaign period, but how useful is that information when the fact of the matter is a vast chunk of total election-related spending are not included in the SOCE’s anyway? Moreover, it’s interesting that VP candidate Cayetano was cited as having donated P71 million which PCIJ called “substantial”. PCIJ described the donation as in the form of “tandem advertisements”. Here's one of those "tandem ads"
PCIJ conveniently failed to define "tandem ads" as “Duterte being mentioned in Cayetano political ads”. This would not have made much of an issue if not for the fact that PCIJ essentially insinuates that Duterte hitching on Cayetano pol ads makes Duterte more likely to turn into a “captured candidate”. This theory is problematic at best as the Cayetano camp would probably agree that it’s Cayetano who needs Duterte’s endorsement more than the other way around. That is, while Cayetano had the money, it was Duterte who had the star power. I voted for Cayetano, and I am very well aware of that fact. Totohanang usapan lang ha: utang na loob ba ni Duterte na lumitaw sa commercial ni Cayetano, o kailangan talaga ni Cayetano na ma-endorse ni Duterte? 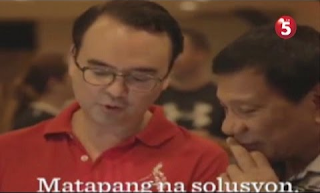 So would that P71 million really make Duterte beholden to Cayetano? I do not think so because that would’ve implied that the Marcos Burial wouldn’t have happened [TP: Cancel Burial], as Cayetano is against the Marcoses [CNN]. I think PCIJ, with its resources and connections, has been very lazy lately. PCIJ said “contributions amounting to P10,000 and below reached a total of only P175,313, which is not even half of one percent of his campaign funds”. But why didn’t PCIJ even attempt to estimate “de facto micro-donations” that were integral in the Duterte Campaign but cannot be directly measured? 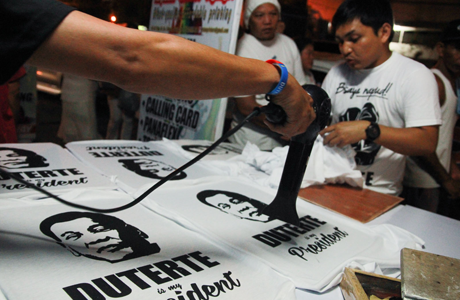 For one, PCIJ failed to take into account the countless number of Duterte shirts printed by volunteers who are not officially connected to the Duterte campaign [MS]? With a modest estimate of 1000 plain shirts per province times a production cost of P200 per shirt times 81 provinces, that would already amount to P16 million nationwide! During the elections, regular citizens took the initiative to campaign for Duterte. PCIJ failed to take that into account. And we're just talking about the T-shirts: we have not even included the Duterte ballers, the tarpaulins, and the costs of independent pro-Duterte grassroots groups. This is my point: PCIJ unnecessarily limited campaign spending into what’s in the SOCE. However, in light of the Duterte’s unorthodox campaign, old definitions don’t apply anymore. Has PCIJ been left behind by the times? PCIJ should take every effort to make sure that their articles describe reality as accurately as possible. However, judging from the gaping holes in this PCIJ SOCE series, it appears that PCIJ, who once had a reputation of engaging in out-of-the-box journalism, has become as dangerously bookish as the rest of traditional media. Is the PCIJ’s SOCE series still useful in evaluating the status quo of Philippine elections?